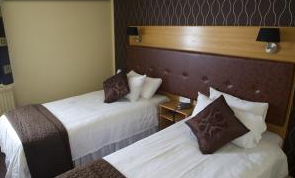 Just off the A19 and only 3 miles (5 km) from Middlesbrough's town centre, railway station and football stadium, the Blue Bell offers free Wi-Fi, free parking and great-value rooms. The Blue Bell has a convenient location with good access to the North and South and to the region's major road network. The town's major business parks are within easy reach and the University of Teesside is less than 10 minutes' drive away. The good location also makes the lodge a great base from which to explore Whitby, the North York Moors, Heartbeat Country, Herriot Country, the Captain Cook Trail and Hartlepool's Historic Quays. The Blue Bell Pub is well known for its friendly, relaxed environment and a wide range of great food is available from12:00 to 21:45pm. A local community pub, the Blue Bell also shows live sports and occasionally hosts themed nights, charity events and much more.